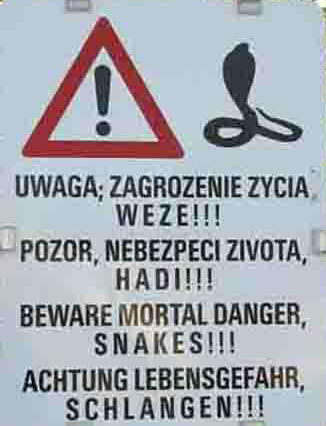 Austrian officials fed up with motorists stopping to urinate by the roadside have put up fake snake warnings to scare them into using toilets. There are just some places you don’t want to be snake bit. A German burglar who broke into a sports club was arrested after he turned on the floodlights so he could see in the dark. Bumbling thief Johann Stark, 46, also managed to switch on the football pitch sprinkler system after he broke into the club in Aachen at 3am. Police were called out by the club’s groundsman who saw the floodlights from his nearby home.